The City of Portland owns three locomotives, the oldest of which is Oregon Railroad & Navigation #197 (OR&N 197). The OR&N 197 is a 4-6-2, or “Pacific” type steam locomotive built by the Baldwin Locomotive Works in 1905. Originally built to pull passenger trains on the Oregon Railroad & Navigation Co., a predecessor to the Union Pacific Railroad in the State of Oregon, this locomotive served successive companies for half a century. The engine was eventually renumbered to 3203, and was finally retired by the Union Pacific in the 1950s. 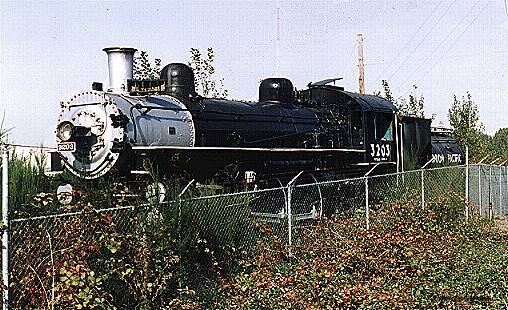 The City of Portland saved the OR&N 197 from the scrap yard and placed her on display at Oaks Amusement Park where she sat until the mid-90s. In 1995 a group of railroad aficionados got together to consider ways to return her to operation. On February 10, 1996 (coincidentally near the height of severe flooding along the Willamette that year), they removed her from the riverside Oaks Park and brought her to the Brooklyn Roundhouse for restoration. The Oregon Rail Heritage Foundation is looking to move her (and the Spokane, Portland & Seattle #700 and Southern Pacific #4449) to new digs by the end of the year – they are being evicted! The goal is to secure a new home for these historic behemoths near OMSI.